This is my recipe for canned salsa. 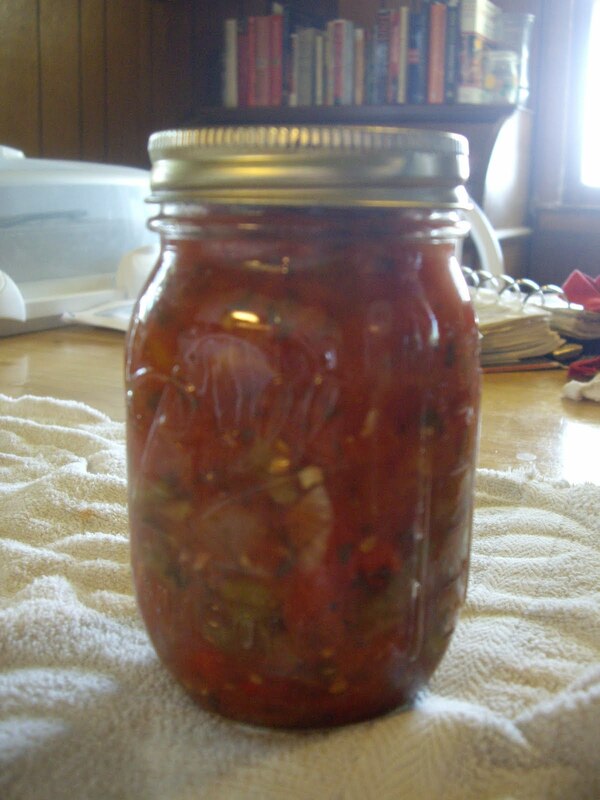 I make fresh salsa as along as I have tomatoes and peppers growing in the garden. But, when winter comes I need salsa in my pantry. Ready 6 pint jars for canning. You can also get pint size freezer containers instead. You will also need a water bath canner for canning. Peel and seed the tomatoes. Chop and place in a colander to drain for 30 minutes to an hour. Place the tomatoes in a dutch oven, probably about 5 quart size. Simmer, uncovered about an hour til thick and chunky. Stir frequently. The juicier the tomatoes, the longer it will take to thicken up. While, the tomatoes are cooking down, chop the onions, peppers, cilantro, and garlic. Put that into a large bowl and add the vinegar, sugar, salt, and pepper. When the tomatoes are ready add the pepper mixture. Remove from heat and ladle into the prepared jars. Process in the water bath canner for 35 minutes. If you prefer, ladle the salsa into freezer containers and freeze for up to a year. You will get 5 or 6 pints. If you want mild, use 3 cups bell or Anaheim and 1/3 cup jalapeno. If you want medium, use half one kind and half the other. If you want hot, use 3 cups jalapeno and 1/3 cup Anaheim. Serranos are also good in this salsa. Some flours need different storage than others. For example, pastry flour should be stored in the freezer. It will not go bad, but pastry is best made with cold ingredients so keeping it cold in your freezer is only good sense. Whole grain flours, such as soy or wheat should be stored in the freezer also. Whole grain flours have a tendency to go rancid unless used up quickly. So, by keeping them in the freezer, they will last a lot longer. All-purpose flour( both bleached and unbleached), cake flour, and bread flour are fine if they are stored at room temperature. They are not going to turn rancid. And if you use your flour for making bread, you don’t want your flour cold.